Rome has two airports. Leonardo da Vinci Airport (at Fiumicino) is used by the major airlines, while Ciampino Airport is used by budget airlines Easyjet and Ryanair. Officially named Leonardo da Vinci Airport, Fiumicino is a major port of call for intercontinental as well as national and European flights. The airport is situated 32km from the city, close to the sea. The most straightforward way to get into Rome is to take the Leonardo Express, a direct train service to Rome's main railway station, Stazione Termini (more information below). Tickets cost €11 and are one-way only (so buy extra for your return journey if you want to be organised), and must be stamped in the validating machines on the platform before you board the train. From the main arrivals area, just follow the signs. The service runs every 30 minutes, between 6.30am and 11.30pm. Every so often there has been a spate of news stories about tourists being conned by drivers; make sure you take an official marked taxi from the rank. These are white, with 'taxi' lights on top, and each has a taxi license number. To prevent travellers from being ripped off, Rome authorities have capped airport taxi prices. From Fiumicino into central Rome (anywhere within the Aurelian walls, which basically includes the central tourist area) the set fare at the time of writing is 48 euros. If you have problems, ostentatiously write down the taxi's license number (check this is displayed in the cab when you get on board), and ask for a receipt. Call 060606 to report any problems. Ciampino is a military airport which has been developing its passenger terminal since it began playing host to the budget airline companies. Although it's still small, without a lot in the way of services or entertainment, the airport's facilities are growing. You can buy reasonable snacks, books and souvenirs in the departures area, although the arrivals hall is crowded, without much to help tourists. There are a variety of ways to get from Ciampino into Rome including a couple of direct coach services. 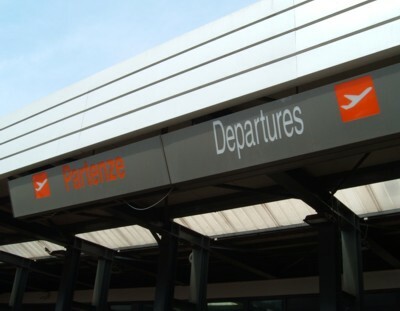 Since so many of our readers arrive at Ciampino, we've written a whole page about your transport options: Ciampino airport transport. The Leonardo Express from Fiumicino stops at a rather remote platform. Don't go down the first flight of stairs you see; follow the platform until you see a moving ramp going downwards, labelled with an 'M' for the Metro. This moving walkway takes you the considerable distance into the heart of the station concourse. If you're staying in the Centro Storico, consider taking a taxi from Termini (the official taxi rank is outside the station, beyond the main concourse, in the large bus station area); it will save you sweat and bother. Note: don't follow the taxi touts who sometimes waylay tourists getting off the Leonardo Express.